Prague May Day Blowout – Commies Clash with Opposition! Political parties and other groups held events in Prague and elsewhere in the Czech Republic on Tuesday marking May Day, which is a holiday. The Communist Party had a gathering at the capital’s Výstaviště, the Social Democrats were on Střelecký ostrov, ANO were at Ladronka and the Civic Democrats were on Petřín hill. Anarchists organised a gathering in Prague while the far-right Workers Party of Social Justice and other groups came together in Plzeň. In the Czech Republic May 1 is also considered a day of lovers and homosexual rights group We Are Fair created a huge cake in Prague in support of marriage equality. Communists clashed with Anti-communist protesters durning today’s May day rally in Prague. The May 1st celebrations had not even begun, and they are already struggling with problems – at least t Communists. In contrast to other years, the Holidays celebrated work without serious incidents. At the Communist rally at the Prague Exhibition Grounds, an anti-conflict team helped end a verbal battle peacefully between supporters and opponents of the KSCM solved. Police officers also had to intervene in a minor conflict at the assembly of the anti-immigration parties in Pilsen, where the opponents of right-wing extremists arrived. 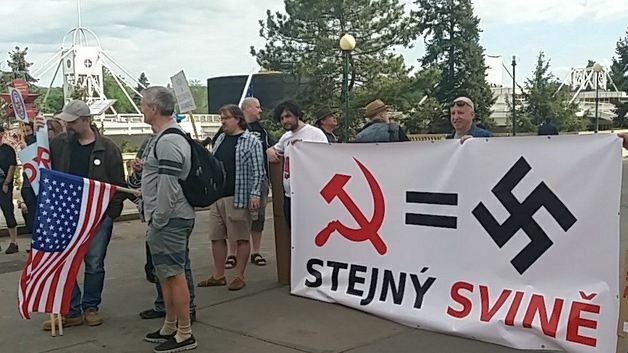 Marta Semel of the KSČM wants to file a criminal complaint against the authors of the banner with an equal sign between the communist symbols of the sickle and the hammer and the Nazi hook cross. It was for the morning event at the Prague Fairgrounds. Throughout Russia, the May Day demonstrations attracted around three million people.